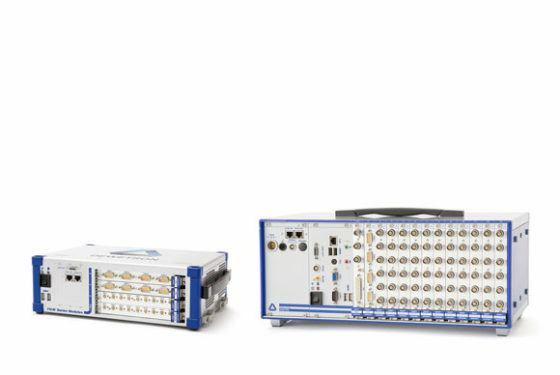 DEWETRON’s universal and modular data acquisition hardware offers flexible and easily customized system configurations. Choose the ideal chassis for your test environment – portable, mainframe or channel extension. All-in-One systems with built-in display are the most convenient data acquisition hardware systems for mobile applications. These systems are equipped with a powerful PC inside and are easily configured. Mainframes are very popular for test benches and environments that are poorly accessible or hazardous to people. To that end, the compact and flexible DAQ hardware mainframes are used with external displays. 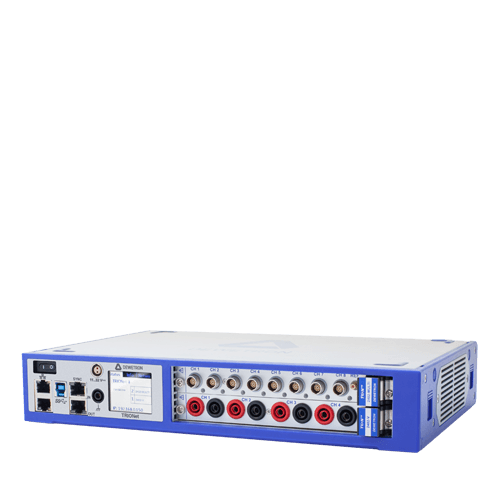 Front-end data acquisition hardware is high-speed channel expansion for other DEWETRON DAQ hardware systems. Connect them via USB, Ethernet, PCIe or Thunderbolt. Industrial PCs are used on the bench top or as 19”-rack mount units in the lab or as ultra portable instruments in the field. Electrical motors with 6 or 9 phases are now state of the art. For that reason they are increasingly used in highly efficient electric drive trains. A holistic analysis of the drivetrain is no longer possible with a conventional power analyser. Furthermore, expensive synchronization, costly extensions, additional costs for software licenses, and calibration are the consequences of continuing to use traditional methods of power analysis. With the DEWE2-PA7, DEWETRON offers a high performance Power Analyser that meets the dynamic demands of development engineers and measurement technicians. With this in mind, up to 12 power channels with precision accuracy, power calculation of up to 9-phase systems, and online power calculation of several power groups (DC and AC) are standard features. Additionally, the synchronous and complete detection of mechanical parameters and environmental parameters (e.g. 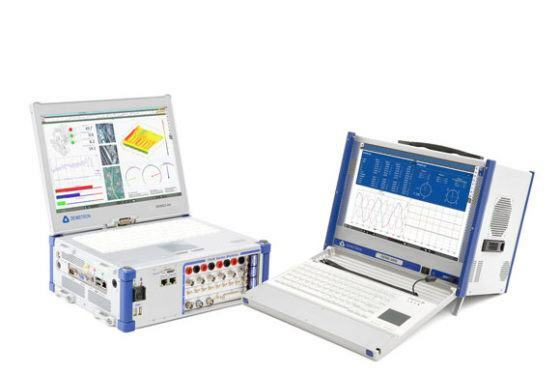 speed, torque, temperature) deliver robust analysis. Regardless of what you are testing: electric motors, batteries, inverters, entire drive trains or complete vehicles, do it all with a single Power Analyser. The DEWE2-PA7 replaces several systems by performing their tasks with unparalleled modularity and flexibility. A single system reduces the time for training and commissioning. Accordingly as a single system, it reduces costs of regular calibration of the measurement technology and software licenses. In the long run, the PA7 saves valuable development time and ensures reliable data in a single file format (“Single point of Truth “). During the development and testing of electric machines, various tests are performed to determine robustness, performance and efficiency. In this testing process, drive trains are powered up under various scenarios and evaluated via performance indicators. With conventional power measurement systems, a sufficiently broad measurement range must be chosen, which at lower load leads to a lower accuracy. For individual load points the configuration must be adjusted which in turn increases the time required for the configuration. Wasted time causes the test rig to be blocked for an unnecessarily long period. With the dynamic, precise high voltage inputs of our PA, only one measuring range, from several Volts up to 2000 Volt,s is necessary This eliminates the need to adjust the measuring range. This also avoids errors and reduces the time required to configure the “right” measuring range. In addition, the disadvantages of a measuring range changeover (transition range, no continuous measurement data) are eliminated. 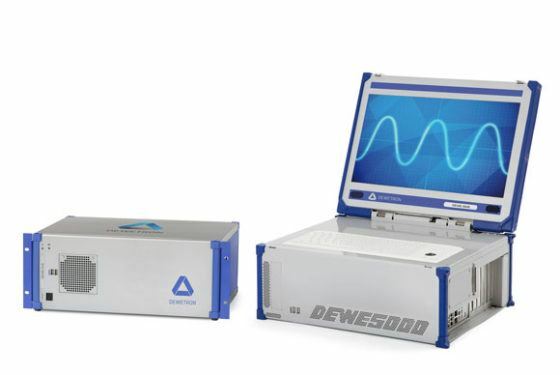 With the DEWE2-PA7 Power Analyser and the DEWE2-series measurement systems, DEWETRON offers professionals high-performance, easy-to-use “tools” with an intuitive operating concept, simple configuration and precision accuracy.